A very successful children's event was held in the museum on the Saturday October 23. 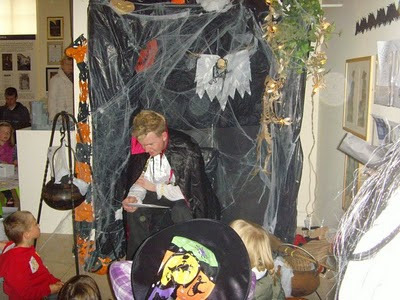 The theme for the event was based on "Education through fun" telling the history of Halloween in Ireland. The children listened to the stories of Jack O'Lantern and Petticoat Loose, as well as colouring and crosswords. The day was organised by Helen Moynihan, Education Officer and assisted by Tony Hayes, Roberta Whelan, Darren Moynihan, Emma Walsh and Niamh Power. Darren Moynihan, story telling to the children. More photographs of the event can be seen on the museum's facebook page.